Absolut vodka, coconut, bacardi, peach & mango puree, orange juice & a sinker of grenadine. Classic, mango, passion fruit, watermelon, raspberry, strawberry & green apple. 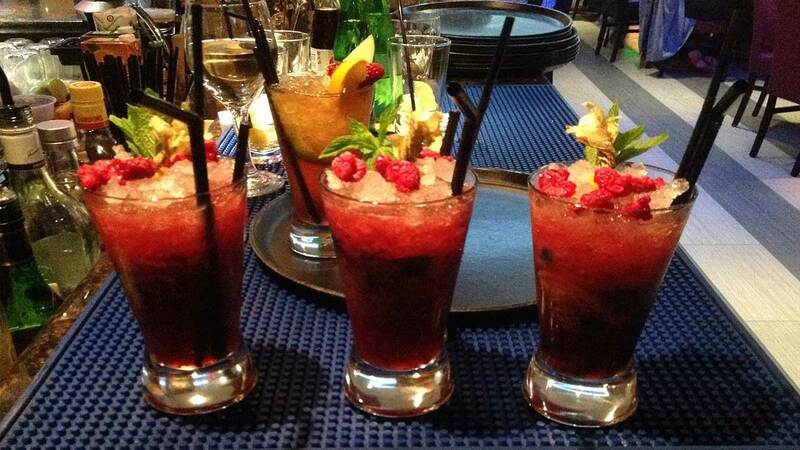 Bacardi, lime cordial, mango puree,raspberry puree & fresh fruits. Absolut vodka vanilla, passoa, passion fruit puree, fresh passion fruit & prosecco top up. Absolut vodka, lime cordial & bubble gum syrup. Sweet & sour - perfectly balanced,intense and unique. Kahlua liqueur, absolut vodka & a shot of espresso. Jack Daniels, Amaretto, vanilla syrup, lime rancho, angostura bitters. Tanqueray gin, Martini Bianco, lime rancho, topped up with rose lamonade. Absolut vodka, bombay gin, bacardi, triple sec, lime squeeze, blackberries, topped with coke. Limoncello,mango puree,raspberry puree,fresh mint,raspberry sorbe, topped up with prosecco. Champagne, cointreau, fresh orange juice. Champagne, aperol, slice of fresh orange. Absolut vodka, fresh squeeze lemon,blue curacao, 7up. Bacardi, fresh lime juice, topped with coke. Absolut vodka, spices, tomato juice. Brandy, lemon squash,angostura bitters drops, soda water. Absolut vodka, peach schnapps, cranberry juice. Disaronno, fresh squeezed lemon,topped with soda. Fresh lime & mint leaves muddled with sugar syrup topped with club soda. Fresh Orange Juice, yuzu puree,strawberry puree. Homegrown basil, Edelflower syrup, apple juice & soda. Pineapple juice, vanilla syrup, fresh lemon juice, raspberry puree, topped up with elderflower tonic.